Last week, fishing a popular local creek, two trout refused, after some Marinaro-type deliberation, my carefully presented dry fly. Dry flies I should say. I flung a number at them. A few days ago a carp looked at my crayfish pattern, a pattern that had caught carp previously, and then, very slowly, like a person realizing they had sat next to the nutcase on the bus, made an exaggerated detour around the fly and its negative vibes. Recently my children were dangling a line in a lake’s margins. They were after small bluegill, ubiquitous denizens of the marginal weed around popular fishing spots. The bluegill ate the free kernels of sweetcorn dropped to them but after only the briefest of inspections flatly refused to eat the kernel stuck on the hook. All sorts of interpretations could be put forward to explain the behavior of these fish. Among fishermen a favorite is that through experience those trout, that carp and the little bluegills have all learnt that the flies I presented, as well as the corn my daughters dangled, should be treated with caution, a caution born of the experience of having been caught before. To think this begs a number of questions about the intelligence of fish. Are they that clever? Can they really learn and remember in the sort of detail required to discriminate between the bait alone and the bait on a hook, between a real mayfly and one tied to ape reality? 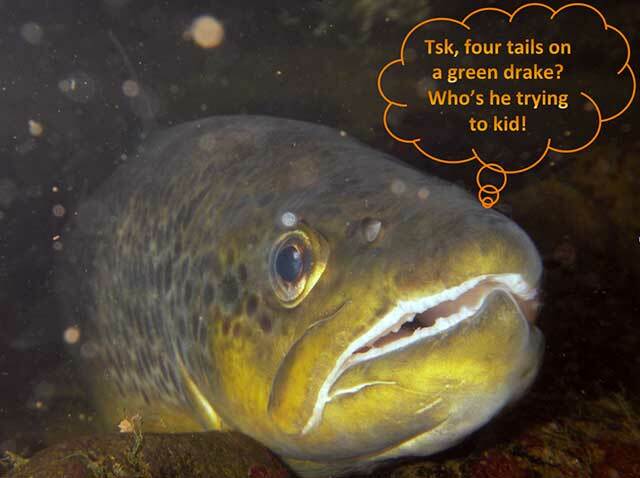 If a trout has been caught on Harrop’s hair-wing green drake, or a bass on a Dahlberg diver, or a bonefish on a Merkin crab, will they be less likely to take the same pattern again? These questions, in one form or another, have long been favorites whenever fly fishermen band together for a chat on the banks of a river, in bars or nowadays, in the electronic environment of blogs, forums and message boards. And the question divides opinion. Many fishermen readily accept that fish can distinguish between real and artificial and point to the fact that they are much harder to catch from waters that receive intense angling pressure. Proponents of this line of thought have little problem imagining a fish discriminating against a fly on differences in color, size, shape and even, as legend has it, its number of legs. These sorts of description haven’t escaped criticism, not least from other biologists who view the language as anthropocentric and some of the claims, particularly those suggesting fish may be sentient and aware, exaggerated. Reconciling these differences is one of the fundamental difficulties we face when trying to decipher the intelligence and motivations of non-human animals. While there is evidence that fish have much more advanced mental abilities than previously thought, it is probably inappropriate to try and describe a fish’s awareness of the world in terms of our own. That clever old cove Wittgenstein said: “if a lion could talk we would not be able to understand him.” It is quite possible that a fish’s appreciation of the world is as inaccessible to us as that lion, particularly when you consider the fish lives a life aquatic rather than terrestrial. Having added some context, it’s nice to point out now that our difficulty in getting to grips with how a fish ‘thinks’ is not actually that relevant. Much as we like to discuss whether fish have the cognitive muscle to snub our offerings, the ability to do so doesn’t really require much mental horsepower. Being able to discern whether a potential food item is good—and hence should be attacked and eaten—rather than whether it’s bad and should therefore be avoided, is fundamental to all animals. Fish are no different of course, and though more sorting and learning is done when they are young and inexperienced, it still occurs often enough when they have reached a catchable age. After all, any organism that can’t sort good from bad and remember which is which is very unlikely to live long. Away from us and our baits and lures and flies there are numerous examples of fish learning to avoid food items that are distasteful, may cause them harm, or are simply difficult to eat. One of the most striking is the way in which some bass learned to avoid catfish that have poison spines. Initially the bass attacked and tried to eat the catfish, but within a few trials they’d not only learned to avoid these catfish but applied this to avoiding closely related species they’d no direct experience with before. Tests with variously patterned models showed that the bass learned by remembering the bold spot pattern common across the catfish species tested, but would still attack an unrelated catfish of similar size and shape that didn’t have the same distinctive pattern. Prey that have clear signals displaying their distasteful or dangerous nature are easy for fish to learn about and remember to avoid in the future. Cod exposed to brightly colored and distasteful sea slugs avoid further contact after just one trial. Water mites, those familiar little bright red invertebrates that look like small spiders and swim so insouciantly in the open water, are also avoided by fish that live in the same habitats. Naive fish quickly attack the mites, their active nature and bright color attracting attention, but over a few trials these inexperienced fish also learn that the secretions from the mites glands are distasteful and subsequently avoid them. The rapidity with which fish learn to avoid prey that clearly display their unpleasantness, the bright reds and yellows of mites and sea slugs, the bold spot patterns of catfish, indicate that our more garish flies may well be targets for rapid learning and subsequent avoidance. But fish don’t rely solely on their color vision or pattern recognition to learn the cues necessary to avoid distasteful prey items. 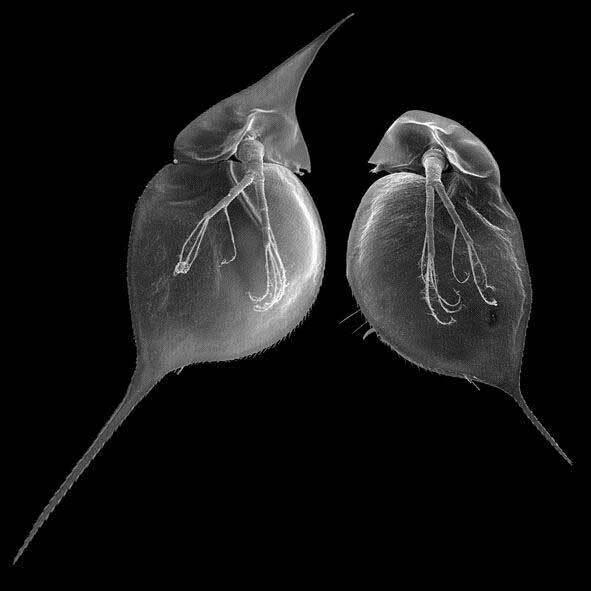 One of the most striking is their ability to discriminate between different morphs of the same species, like the two Daphnia in the photo below. Two morphs of the same Daphnia clone. Fish can learn to avoid the spiky, difficult to swallow one and eat the other. Photo credit: C. Laforsch by permission of the Royal Society. In the presence of fish predators many water fleas develop protective spines. The spines are not poisonous or distasteful in any way, they simply make it difficult for the fish to swallow them. A fish could find many more palatable items in the time it would take to eat just one of these spiky little crustaceans. And that, after some trials, is what they do. Again, like the response to water mites, fish that have gained some experience with the morphs with spines reject them in favor of the less prickly morphs. This level of discrimination can be quite acute. Fish feeding on another crustacean, the invasive ‘spiny water flea,’ also learn to avoid eating them. But experiments that removed the spines showed that after some trials fish learned to tell which water flea had spines and which did not, ate the latter and avoided the former. The same happens with larger prey items for pike and perch have been shown to learn about and then avoid sticklebacks in favor of less well defended prey. So fish are pretty adept at sorting out what’s what in their food world. As they grow they learn what to eat by experience and by watching others; they become more efficient at catching and eating the abundant food items in their environment; they can adapt to novel prey and, after a period of testing, accept or avoid this new food source. One would have thought then that they should be able to learn about the deceptions offered by fishermen. And the evidence is that they can. Studies from over fifty years ago showed that bass can tell the difference between a hooked worm and one that isn’t and, like the bluegill that frustrated my daughters, they quite happily clear up all the free offerings while leaving those impaled. 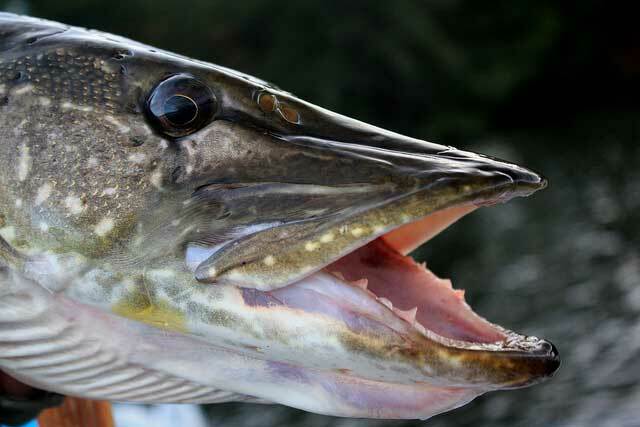 Cod become much more wary and difficult to hook after being caught a couple of times. Carp—a fish whose reputation for sagacity drives a huge market for baits and rigs almost exclusively shaped by this perception of their intelligence—can be one time learners, avoiding hook baits and remembering to carry on doing so a year after their initial, and only, capture. Even pike very rapidly learned to avoid spinners. These simple experimental results have been complimented by field studies looking to see whether fishing pressure changes how easy fish are to catch, that is whether the “catch per unit effort” declines over time. Fisheries managers fret about this value. A low CPUE, might mean their department is not providing the sporting experience some fishermen expect. Among the various reasons that may be responsible for lowering catch rates some studies have been directed specifically at whether fishing quality (a nebulous term to define I admit) has declined due to “learned hook avoidance.” And judged by catch rate alone, it has. Catch rates of bass subjected to different degrees of angling pressure over time dropped from three fish an hour at the lowest angling level, to just over one bass an hour at an intermediate level, to less than half a bass an hour at the highest level of fishing pressure. Very similar results have been shown for carp. Even domesticated lines, which were easier to catch initially, subsequently learned to avoid the hook bait as quickly as wild carp and catch rates were equally reduced after a week’s fishing. There are fewer examples from fly fishing, but two good studies have examined the impact this method has on catch rates and fish learning. In one, rainbow trout fished for four hours a day showed high capture rates initially but these declined rapidly after five days of angling. A month after the initial fishing ceased the trout were still difficult to tempt and a further month later catch rates remained low. Some of this decline was natural, as the summer progressed trout in both high- and low-pressured lakes became slightly more difficult to catch. But in the high-pressure water the rapidity of the decline could only be explained by the resident trout learning to avoid the nymphs and leech patterns that had been cast at them. The second study fished the iconic backcountry rivers of New Zealand’s South Island. 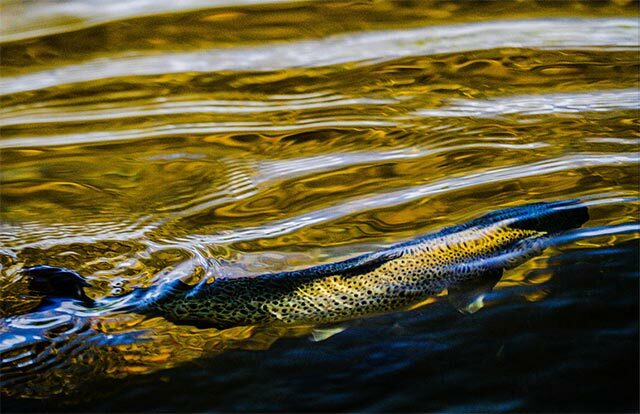 New Zealand trout have a reputation for being very intolerant of disturbance. 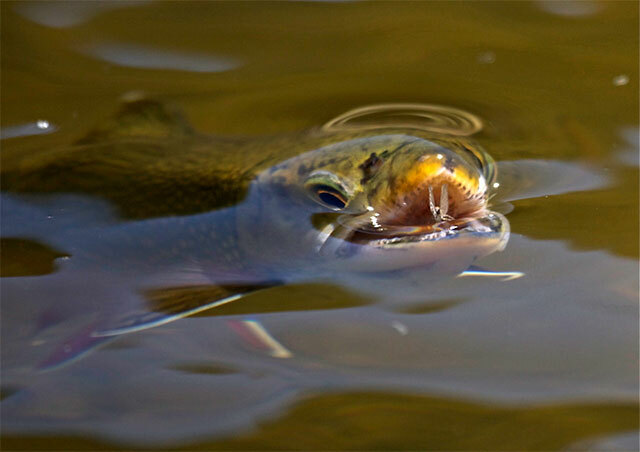 Using the little fished and remote Ugly River and the more accessible and more heavily fished Owen River, the researchers demonstrated that this was true—the Ugly River trout stayed hidden for two to three days after being spooked whereas the Owen River trout quickly returned to their stations. This sensitivity to disturbance did not mean the Ugly River fish were also more difficult to catch. Far from it. Ugly River trout required fewer casts and fewer fly changes to hook and in the end three times as many were caught compared to the Owen River. That’s not to say these easy trout remained dunces. As the fishing pressure accumulated over the four visits the Ugly River trout that had been caught before became more difficult to catch. Perhaps then fish shouldn’t be viewed as the dumb pea-brains with a three-second memory that has been prevalent for so long. But we also shouldn’t get carried away extolling their professorial qualifications. They, like many other animals, face numerous challenges and deciding what is good to eat and what isn’t is a very common behavior— particularly for those with the eclectic taste of many game fish. By showing that they can assess and respond appropriately to opportunities and threats in their environment fish are simply exhibiting good adaptive behavior. That the behavior can be complex and in some cases minutely discerning just shows how well-adapted, how fit for their environment, they really are. *The image of the two daphnia clones is reproduced from: Engel, K. & Tollrian, R. Inducible defences as key adaptations for the successful invasion of Daphnia lumholtzi in North America? Proc. R. Soc. B. 2009, 276, 1865-1873.